as Assistant Professors or lecturers. This time MPSET is going to conducted for 19 various subjects of Arts, Science and humanities. Online application process starts from 14-10-2018. Interested candidates can register through online before closing date of 14-11-2018. Last date to submit application form is 29-11-2018. 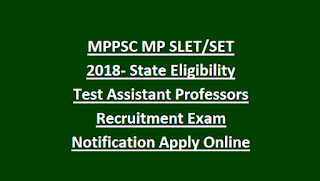 For more details like Application form procedure, Exam date, Exam syllabus and pattern regarding this Madhya Pradesh State Eligibility Test MPSET/ MPSLET 2018 are mentioned below. Online application process starting date: 14-10-2018. Last date to submit online application form: 14-11-2018. Last Date to reach application form to MPPSC is: 29-11-2018. Applicants must have qualified Post Graduation Degree or Diploma in any relevant subject from recognized University or Institution. Candidates who have appeared or appearing for final year exams of Master’ degree are also eligible to attend the exam. 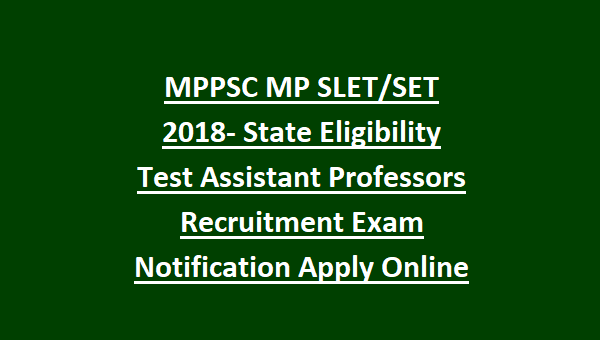 There are total 19 subjects available in this current Madhya Pradesh State Eligibility Test MP SLET 2018 for Assistant Professors in the streams of Science, Arts and Humanities. For OBC/ SBC (Non Creamy Layer)/ SC/ ST/ PH is Rs. 600/-. Madhya Pradesh SET/ SLET exam will be conducted for 300 marks and consists of two papers. 3 papers are in the form of multiple choice questions only. There is no negative marking for wrong questions in this MP SET 2018 Assistant Professors Eligibility Test. Paper 1: Consists of 50 questions (100 Marks and the time duration is 90 minutes). Paper 2: Consists of 100 Questions (200 Marks and the time duration is 120 minutes). The Commission will prepare merit list based on minimum % of marks obtained in the examination given by the candidates. The Examination date and Admit Card will be uploaded soon on MP official web portal. Candidates are advised to visit MPPSC official website regularly to know date of Examination, Exam centers. Candidates must download Admit Card from the official website. MP SET Admit Card is the only key to appear into Examination Hall. The Syllabus for Paper I will be similar to UGC NET Examination. For syllabus details please visit Madhya Pradesh official Notification. MP SET Results: After giving MP SET Examination, candidates are eager to know the results. MP SET answer key will be mailed or available at MP official website. Indore, Bhopal, Gwalior,Jabalpur, Rewa, Satna, Sagar,Ujjain. Eligible/ Interested candidates submit their applications through online from Madhya Pradesh University official website @www.mppsc.com/ www.mppsc.nic.in/ www.mponline.gov.in. Last date to submit online applications is 29-11-2018. For more information regarding this MP SET 2018 contact No: 0731- 2702689 or by sending an email: mppsconline@gmail.com or logging on to: Website: @www.mppsc.com.